Since it was founded in 2004, Associated Content has grown by leaps and bounds simply by feeding people’s need to be published writers and get paid for the traffic their article generates (feeding the needs of the people is kind of the raison d’etre of the entire Internet, in a sense). 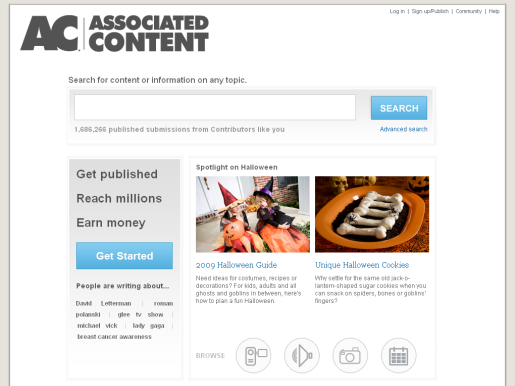 Associated Content brings in over 16 million views a month, and features over 50,000 new articles, videos, and images per month. That incredible growth caught the attention of powerful suitors (and imitators like AOL’s Seed), but Yahoo has bought Associated Content. The terms of the deal were not disclosed. Yahoo is flagging behind in the search engine world, and they’re trying to increase views on their front pages; there’s no better way to do that than to increase the content on those pages. That’s where Associated Content comes in. “Together, we’ll create more content around what we know our users care about, and open up new and creative avenues for advertisers to engage with consumers across our network,” said Yahoo CEO Carol Bartz. Yahoo also plans to expand Associated Content internationally, which seems like a wise decision. The deal is expected to be finalized in the third quarter of this year. I’m not sure the move will help Yahoo long-term, but it’s better to own it and not need it than need it and have a competitor own it.